It felt strange to just take picture of my face. I'm so used to taking full body shots, it felt so weird to be to focus solely on my face. I quite like my face. I always have. I don't wear a lot of makeup. Only when I'm going out. The only thing I didn't used to like was my extra chin. But now I say 'YAY TO ALL THE CHINS!'. I like the roundness and fullness of my face. Apart from making me look younger than my years (which I'm sure I will appreciate more later in life) it also means that I don't have a lot of wrinkles. A few round the eyes and mouth. But they're good. They mean I've laughed and cried and generally experienced life. I have always really liked my eyes. They are super blue. They've seen lots of the world, read lots of books, and looked upon the faces of my loved ones. I see both my parents in my eyes. My nose is my Mum's. It's been pierced since I was 13. I have full, beautiful shaped lips, and I've always really liked them. They used to cause me hell when I was younger with cold sores, but not so much any more. My little brother and I went and got our lips pierced one night when I was 22 and he was 16. We didn't tell anyone and then sent a photo to our Mum afterwards. She's since gotten used to getting photos likes that. All in all I think I have a good face. It's a kind and gentle face. Want to join in? 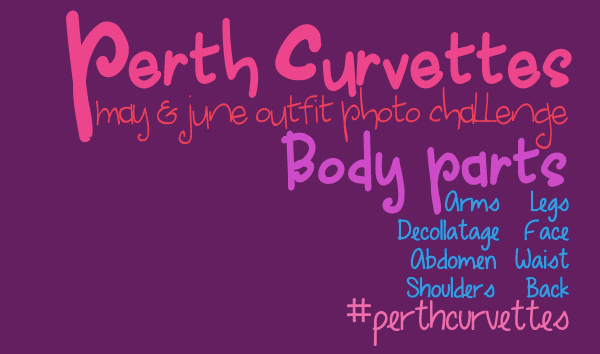 add your blog to the linky below or use #perthcurvettes on Instagram! i love this post - i think you have such a cute & friendly face! Awwww so cute. I like the fourth photo it's very silly and awesome. I feel like just taking pictures of my face would feel a bit weird but maybe an exercise I should try out.